URentMe aims to be the USA's #1 simple-to-use Peer-to-Peer Marketplace for Powersports, RV's and motorized Watercraft. We believe we are the only existing online platform that offers full comprehensive insurance on all Powersports and RV's. At URentMe we provide additional peace of mind to owners by running Motor Vehicle checks on all prospective renters. URentMe is providing owners with earnings to at least offset their costs and earn additional income. 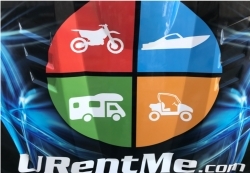 Henderson, NV, January 11, 2019 --(PR.com)-- URentMe.com, a disruptive online marketplace for renting Powersports of all types, RV's, trailers and motorized watercraft, today announced they are offering to the public the chance to invest in their rapidly growing business. "We are looking to raise additional capital especially for Marketing, to increase our demand for listings of rental vehicles and to grow the general awareness nationwide of the opportunities URentMe has offer, both to owners and aspiring renters. We are providing a limited window to make an early stage investment through our crowdfunding campaign at https://www.startengine.com/urentme,” said Founder and Chief Operating Officer, Anthony Horovitz. The URentMe offering now allows accredited and non-accredited investors to participate in the only online marketplace that offers the range of Powersports including RV's and Trailers. URentMe believes there are more than 62 million recreational vehicles in the USA, with the majority used by owners for no more than 21 days a year or less. Owners have the opportunity to earn a sizeable income to at least offset costs, while renters can enjoy luxury "toys" that they would not normally have access to. Already fully operational in Western States, URentMe's simple-to-use online platform, and iOS and Android apps, offer full comprehensive insurance, a secure escrow-based payment system and additional peace of mind through 24/7 roadside assistance and running Motor Vehicle checks on all prospective renters. URentMe believes that, as the trend continues towards sharing, rather than ownership, gathers pace, their business, based around the explosive sharing economy model, will secure a meaningful position in the leisure marketplace. Founded in 2016, URentMe.com is a peer-to-peer rental marketplace for Powersports, Recreational Vehicles and motorized watercraft. URentMe.com is building a community of outdoor enthusiasts, providing a platform for owners to subsidize the cost of ownership and for renters to enjoy outdoor adventures economically. For more information, visit urentme.com.